Today, I choose to look forward to the day it is overturned. In that vein, I offer a survey of Constitutional Amendments proposed to achieve that end. I will analyze them in future diaries. This is just a reference. Article V of the Constitution provides for two methods of amendment. Congress can propose an amendment with 2/3 approval from each chamber. Joint Resolutions are the vehicles used for this process. Once approved by Congress and signed by the President, 3/4 of the state legislatures must ratify it. Congress shall have power to implement and enforce this article by appropriate legislation. The rights protected by the Constitution of the United States are the rights of natural persons and do not extend to for-profit corporations, limited liability companies, or other private entities established for business purposes or to promote business interests under the laws of any state, the United States, or any foreign state. Such corporate and other private entities established under law are subject to regulation by the people through the legislative process so long as such regulations are consistent with the powers of Congress and the States and do not limit the freedom of the press. Such corporate and other private entities shall be prohibited from making contributions or expenditures in any election of any candidate for public office or the vote upon any ballot measure submitted to the people. Congress and the States shall have the power to regulate and set limits on all election contributions and expenditures, including a candidate’s own spending, and to authorize the establishment of political committees to receive, spend, and publicly disclose the sources of those contributions and expenditures. Congress shall have the power to regulate the contribution of funds by corporations, entities organized and operated for profit, and labor organizations to a candidate for election to, or for nomination for election to, a Federal office, and the power to regulate the expenditure of funds by corporations, entities organized and operated for profit, and labor organizations made in support of, or opposition to, such candidates. 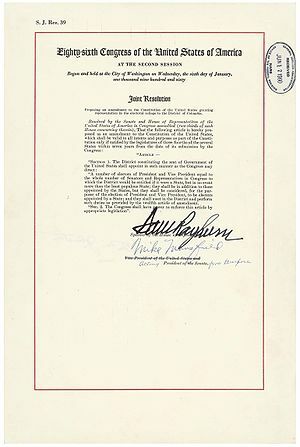 A State shall have the power to regulate the contribution of funds by corporations, entities organized and operated for profit, and labor organizations to a candidate for election to, or for nomination for election to, public office in the State, and the power to regulate the expenditure of funds by corporations, entities organized and operated for profit, and labor organizations made in support of, or opposition to, such candidates. Nothing contained in this Amendment shall be construed to allow Congress or a State to make any law abridging the freedom of the press. Ii I analyze any more Democrat Bills, I will have to come up with a new category for them. expenditure of funds for political activity by corporations. opposition to, a candidate for public office. to abridge the freedom of the press.''. This is similar to my second proposed amendment in that it works to deny Constitutional protection to corporate political spending. This is probably the least disruptive method from a legal standpoint, but it retains the “regulating the hand that feeds” conflict of interest problem. It does not include organized religion, which should not be engaging in political campaigns but do anyway. To be fair, it does not include unions either. On the other hand, unions are associations of actual people, not “artificial persons”. They do not pose the same threat to our sovereignty as corporations. Perhaps someday an adjustment will need to be made, but that becomes a slippery slope problem. The freedom of the press must be maintained, though the corporate media undermines the Fourth Estate through the corrupt use of ownership powers. Article V of the Constitution. This is a simple and straightforward answer to Citizens United. Without a mandate, I think that there would be many partisan battles over regulation. Especially when one party confuses corporations with living people. I also think it needs an enacting clause. Other than that, I like it. I usually reserve my analysis for the republican clunkers. This is the second time I have analyzed a Democrat Bill. Mr. Udall of New Mexico (for himself, Mr. Bennet, Mr. Harkin, Mr.
Durbin, Mr. Schumer, Mr. Merkley, Mr. Whitehouse, Mr. Begich, and Mrs.
support of, or in opposition to such candidates. this article by appropriate legislation.''. It does not cover issues. While issues are not directly on the ballot, they are still an integral part of a political campaign. It does not cover Constitutional Amendments. The politicians setting the regulations, without direction or mandate, are the ones who benefit from the current state of campaign financing. This leaves plenty of room for continued influence peddling. It does not cover issues. It does not cover referenda. It does not cover local elections. It does not cover other Questions put to the voters, such as millage. It does not cover cross-state interference in local politics. The sovereignty of the individual states is being challenged by out-of-state money. None given (yet), but Article V of the Constitution covers it. I do not believe that this proposed amendment goes far enough to protect our democratic process from the influence of non-citizens or the excessive influence of the very rich. 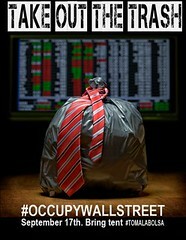 Wall Street Occupation — a Cry to End Corporate Influence in Elections? Corporate influence has robbed us of our sovereignt­y. Getting corporate money out of politics is key to restoring government by consent of the governed. I see two courses of action, both of which involve amending the Constituti­on. This poses a significan­t problem due to the appropriat­ely high bar to change imposed by the amendment process and the absolute devotion of republican­s to the corporatio­ns. Option 1: Completely revoke recognitio­n of “personhoo­d” for corporatio­ns; and restore only the rights necessary to engage in contractua­l obligation­s and other basic functions of business, through changes to the law. Trying to end “personhoo­d” before developing an alternativ­e would create legal chaos that would be economical­ly disastrous­. Legislatin­g an alternativ­e while “personhoo­d” was still in effect would let corporatio­ns design the alternativ­e, rendering the effort expensive and self-defea­ting. Option 2: Restrict corporate free-speec­h rights. This is doable, but a very slippery slope. Conservative activist judges defied precedent and judicial restraint to give unrestrained political speech to corporate entities and special interests without regard for the chilling effect on free speech for natural citizens. Roberts and Alito violated some of the very principles they claimed (during their confirmation hearings) made a good judge. There is much I would like to say on the subject, but Justice John Paul Stevens has already said what needs to be said far more thoroughly and in greater detail than I could ever hope to. With difficulty, I condensed part of his dissent into what I devoted a whole page to. The basic premise underlying the Court’s ruling is its iteration, and constant reiteration, of the proposition that the First Amendment bars regulatory distinctions based on a speaker’s identity, including its “identity” as a corporation. While that glittering generality has rhetorical appeal, it is not a correct statement of the law. The Court’s ruling threatens to undermine the integrity of elected institutions across the Nation. 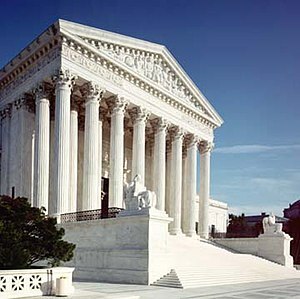 The path it has taken to reach its outcome will, I fear, do damage to this institution (SCOTUS). Essentially, five Justices were unhappy with the limited nature of the case before us, so they changed the case to give themselves an opportunity to change the law. It is easy to take a few sound bites out of context, stripping it of it’s full and intended meaning. In my excerpt, I strove to remain faithful to the dissenting opinion of Justice Stevens, and the length shows it. The result only covers a portion of the dissent, and I recommend reading the whole dissent. If you do not have the time, at least start with my excerpts on my “Citizens United” page.